You can enjoy wonderful walks up to Hanbury Church and out to the newly developed Droitwich Canal. Discover more about the restored park features including the avenues, semi-circle and brick kiln pond. 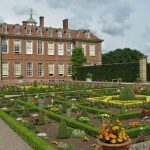 A gardens and park admission ticket upon entry to Hanbury Hall and Gardens, will allow access to the children's playground.